Needed to reach a breathtaking view from the sea and observe the spectacular scenery that offers Mount Conero, in addition to being essential to reach the most pristine and wild beaches of the Bay of Portonovo, the kayak is equally used for both a trip in the family or perfect for an open sea tour allowing a bath where the water is higher. Find out in the section below the services that the Conerostyle school can offer you for Kayaking in the Conero Riviera. The conerostyle has available a dozen open kayaks of all types (single, double, triple), very simple to maneuver and very comfortable. 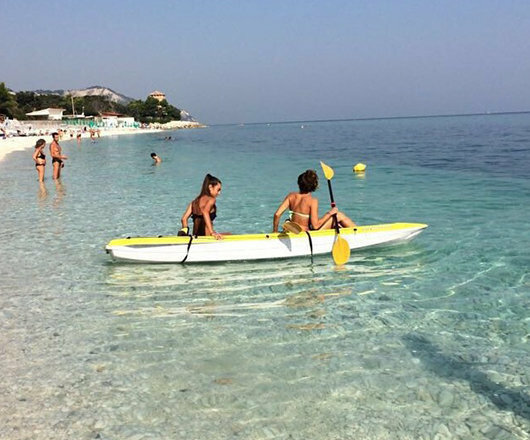 The Canoe – Kayak rental activity is currently available at the headquarters in: Portonovo. The Conerostyle offers the possibility to rent a place in our racks designed specifically to place your kayak comfortably outside the structure, in our private beach area. The storage activity for Canoe – Kayak is currently available at the headquarters of: Portonovo.